(Los Angeles, CA) March 9, 2015 – Geeks rejoice! The brand new digital streaming service CONtv premieres the first CONtv original series, “LAST FAN STANDING,” the hilarious pop culture game show hosted and produced by fan-favorite actor Bruce Campbell (The Evil Dead, Army Of Darkness). A quiz show based on the stuff of Comic Con – sci-fi, horror, fantasy, and superheroes – “LAST FAN STANDING” is the ultimate test of pop-culture knowledge. 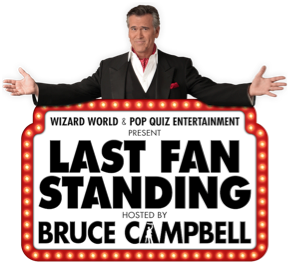 Four fans are put through their paces by host and Con-favorite Bruce Campbell, battling through devilish speed rounds and a nerve-wracking Final Confrontation until only one remains…and a Last Fan Standing is crowned. Viewers can tune-in to CONtv for new episodes every Monday throughout the spring. To see a clip of “LAST FAN STANDING,” visit http://youtu.be/-SJjTyW4toY. CONtv is a new digital entertainment network devoted exclusively to the fanspace that provides audiences access to thousands of hours of content showcasing an original slate of programming, as well as an eclectic catalog of over 1,200 must-watch titles. Everything from quirky original series, elusive cult films & television shows, celebrated genre movies encompassing sci-fi, horror, fantasy, anime, grindhouse, martial arts action, to exclusive live coverage of Comic Con events nationwide, all available on-demand either in a free, ad-supported format or a subscription-based model for premium content. CONtv is a partnership of Cinedigm, one of the nation’s largest independent distributor of digital entertainment, and Wizard World, producers of the largest Comic Con Tour in the U.S. Together, they provide an unrivalled hub of content, community and conventions across the broad spectrum of devices including Android and Mac iOS, Samsung Smart TV, the web, and mobile and tablet devices. For more information, visit CONtv.com. Cinedigm (NASDAQ: CIDM) is a leading independent content distributor in the United States, with direct relationships with thousands of physical retail storefronts and digital platforms, including Wal-Mart, Target, iTunes, Netflix, and Amazon, as well as the national Video on Demand platform on cable television. The company’s library of films and TV episodes encompasses award-winning documentaries from Docurama Films®, next-gen Indies from Flatiron Film Company®, acclaimed independent films and festival picks through partnerships with the Sundance Institute and Tribeca Films and a wide range of content from brand name suppliers, including National Geographic, Discovery, Scholastic, NFL, Shout Factory, Hallmark, Jim Henson and more. Additionally, given Cinedigm’s infrastructure, technology, content and distribution expertise, the Company has rapidly become a leader in the quickly evolving over-the-top digital network business. Cinedigm’s first channel, DOCURAMA, launched in May 2014, and is currently available on iOS, Roku, Xbox and Samsung, with additional platforms currently being rolled out. Cinedigm launched CONtv, a Comic Con branded channel in partnership with WIZARD WORLD, on March 3, 2015. The Company’s third OTT channel, DOVE MOVIE CHANNEL, will be a digital streaming subscription service targeted to families and kids seeking high quality and family friendly content approved by Dove Foundation. Adding to Cinedigm’s diversified portfolio of digital networks​, the Company announced in early 2015 an OTT partnership with TV4 Entertainment and the planned launch of the BRIGHT Edutainment OTT channel. Wizard World (OTCBB: WIZD) produces Comic Cons and pop culture conventions across North America that celebrate the best in pop-fi, pop culture, movies, television, cosplay, comics, graphic novels, toys, video gaming, sci-fi, gaming, original art, collectibles, contests and more. A first-class lineup of topical programming takes place at each event, with celebrity Q&A’s, the Wizard World Film Festival, comics-themed sessions, costume contests, movie screenings, evening parties and more. Wizard World also produces socialcon featuring social media stars and will be launching CONtv, a digital media channel in partnership with leading independent content distributor Cinedigm™. The 2015 Wizard World schedule is available at: wizd.me/PRSchedule2015.